If you live in the Northeastern United States, you probably know all about Japanese Knotweed – even if you aren’t sure what it’s called. The weed is an invasive pain in the neck and can be found all over the place, but it’s particularly aggressive in certain areas and can be difficult to get rid of. But here’s the thing: it’s edible for humans, has medicinal qualities and is an excellent source of vitamin A. What’s more, the roots contain large amounts of the natural polyphenol known as resveratrol and that’s where the magic is for dogs. Resveratrol is also commonly found in red wine which is one of the reasons why red wine is so good for you. However, since we want to avoid giving our dogs red wine or resveratrol from grapes of course, Japanese Knotweed is the best source for your dog. How Can Japanese Knotweed Help Your Dog? Supplements tend to be reliable enough when it comes to Japanese knotweed and resveratrol, but it’s important to remember that clinical trials are limited. While there has been some exciting information regarding the supplement and cancer in dogs, most of the studies involve mice. One study illustrated a decreased rate of the spread of colon cancer in mice who took the polyphenol orally. It’s the anti-cancer application that tends to make the most headlines, with a mixed bag of reports to explore. Some are rather excited about the effects of resveratrol, with some evidence suggesting that the use of a resveratrol supplement having an impact on one or more stages of cancer development in dogs. There is some anecdotal evidence regarding Japanese knotweed and Lyme disease in dogs, so that’s a very good sign. Herbalist Stephen Buhner recommends Japanese knotweed in his book Healing Lyme and notes that it is the only herbal treatment that blocks the bacterial phyla known as spirochetes, which lead to Lyme disease and other infections like bartonella. From what I understand, Stephen Buhner shares an exact protocol in his book (above) for healing lyme disease and preventing lyme disease in pets which also includes cats claw and the homeopathic medicine called “ledum” that you might want to consider if Japanese Knotweed alone does not work. Check out Dr. Sarah Carnes article about the credibility of Stephen Buhner as the BEST herbalist of the lyme world here. Please also see our Tick Protection & Repellent formula here that offers 3 layer protection for your best friend. Along with the benefits of Japanese knotweed, with respect to Lyme disease and the potential benefits of the supplement in terms of fighting cancer, there’s some strong anecdotal evidence regarding its antiviral and antibacterial properties. Some have reported increased energy levels and alertness in dogs who’ve consumed Japanese knotweed roots, but the lack of clinical evidence should also be considered. Despite this limited evidence, there is some anecdotal evidence to suggest that a small dosage of resveratrol in the range of five to seven milligrams per 30 pounds of body weight daily should do the trick. Exceeding this dosage is not wise until further research is done, but the small dosage should help you safely assess the viability of this herbal treatment for your four-legged family member. We recommend a trusted tincture like shown above from Montana Farmacy. Keep in mind that this formula contains alcohol and some dogs don’t tolerate alcohol well. You can work around this problem by diluting the recommended dose with equal amounts of hot, filtered water or working up to the recommended dosage. It can be difficult to convert from milligrams to milliliters, etc. It’s often recommended to simply convert the human dosage into a canine dosage by doing the following. Example: If your dog is 30 pounds, divide 30 by 150. This breaks down to 0.2 or 20%. So, you’d give your dog 20% of the human dosage. Montana Farmacy’s recommended dosage for humans is 30-40 drops 3 times a day. You need 20 percent of say 40 drops three times daily. Take 120 divided by 20 (percent) which gives you 24 drops for your 30 pound dog daily. **THIS WAS NOT CONVERTED USING THE 7 mg PER 30 POUNDS. PLEASE READ: The problem with tinctures and extracts is the alcohol they contain. Some pets just don’t tolerate it, but the alcohol helps to make the herbal tincture effective. A way around the tolerance issue is to dilute the dose of herbal tincture with an equal amount of hot water. This helps to turn the alcohol into vapor by evaporating it. If for some strange reason your dog is on blood thinners of any kind, avoid using Japanese Knotweed. There are no known studies regarding Japanese knotweed and dogs that suggest any known toxic side effects in dogs, but again it must be stressed that research is limited. There have been some studies in rats, where higher doses of the supplement led to significant problems like dehydration, anemia and even kidney problems. It should be noted that research on resveratrol is rather limited when it comes to dogs and most of the available evidence is anecdotal at best. As always, caution should be used. 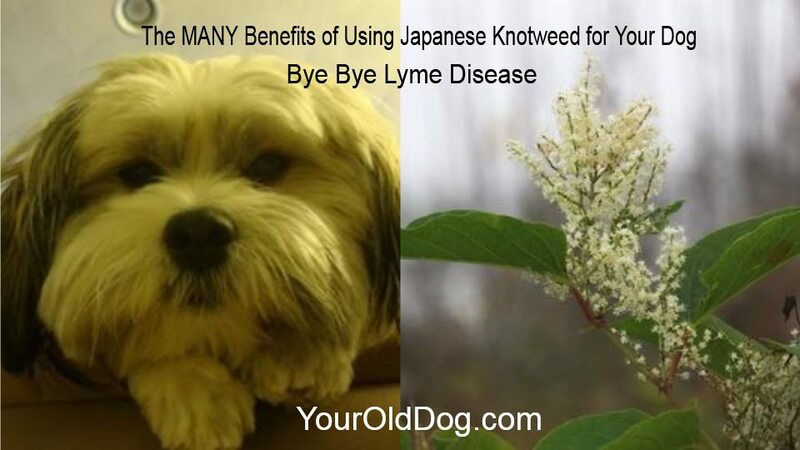 Japanese knotweed has a number of potential applications for your dog, even if research is tenuous, and that makes it an exciting addition to your herbal toolkit if you exercise care. It carries benefits for treating Lyme disease, for instance, and has been reported to have an effect in dogs with cancer. It also packs an anti-aging punch in human beings thanks to an ability to stimulate the SIRT1 gene, so there may be some reason to hope that it carries the same application in dogs. Most herbal retailers have supplements with Japanese knotweed and resveratrol available in some capacity and can inform you as to the side effects and potential usages for your family member. Some have even suggested using the whole root, although application data is limited. My Beagle Jack russel Has Lyme Desease Shes on Antibiotics been thinking of Natural ways What do you Recommend .I Use Seresto Collers.My Vet said she Prob.Had it when I Adopted her From Spca . I would assume that like humans you would give the dosage 5 days on 2 days off or for the month takingbthe last week off. This helps the body to not build a resistance to the plant properties and let the plant help to continue to promote wellness in the body. Hi I’m new to your site. I was looking up something for a 12 yr old wennie dog. I just got her because her owner passed away. She sneezes all the time. And I’m hoping she don’t grieve to much. Does she have any other symptoms? Coughing, what is her stool consistency like? Runny eyes? What do you feed her? My Westie has the same mouth issue, at least I think so. I believe it is ‘lip fold dermatitis’. Every week or 2 I have to soak this stinky hardened crud so I can get it off. I usually use an eye lash comb to try to comb to remove it (or a flea comb). I suspect it is from a yeast overload and I’ve been on this site looking for natural remedies to balance his system. I have to confess that he was probably a puppy mill product, that my vet believed he had an impaired immune system from being wormed or vaccinated too young. He has a severe reaction to wheat and I have to limit other grains in his diet. However he is 12 years old now and otherwise healthy and strong. I was researching turmeric, since it has helped me so much. Any other ideas? I’m glad to hear that your little Westie is pretty healthy and strong, despite the mouth issue. Not sure if you check out the page on yeast help, if not, you can read it here. It might offer some suggestions. I also think that adding turmeric paste would be an excellent idea. I think of turmeric as a wonder plant. It’s a natural healer. I’m so sorry to hear that you spent a lot of time writing a long comment and it didn’t show up. I’ll check into why this is happening. Again I’m sorry, but thank you for letting me know and thanks for your very kind words too. not sure what it is…the scabs are in the same area each time…disgusting! I have taken your advice in the past and my Westie has been feeling better than ever….now, he has been having scab like or dried food like coming from the sides of his mouth at times….what is this? I’m so glad to hear from you and I’m even happier to hear that your little Westie is feeling “better than ever now”. Happy dance!! Regarding the scab or dried food coming from the sides of his mouth; I would take your index finger and starting at the back by the molars, feel the cheeks, gums behind and in front of the teeth and all over the mouth. Feel for any lumps or abscesses. Do you brush or clean his teeth with sprays, etc?